When fifteen-year-old Dee is left at her grandpa's farm in rural Washington, she thinks life is over. She may be right. 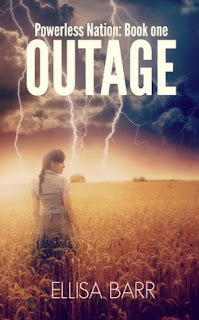 A high-tech electro-magnetic pulse (EMP) attack destroys the country's power and communication grids, and sends the U.S. hurtling back to the Dark Ages. Can Dee learn to survive without the basics: electricity, clean water... even her cell phone? The chaos caused by the EMP isn't her only problem. A sinister plot by a corrupt official threatens Dee and all she holds dear. She will have to fight if she wants to survive in this hostile new world. I've been on a post-apocalyptic kick lately, and this one was a winner for me! I loved this story from the first page. It doesn't take long for the action to start, and when it does, it was amazing through the very end. I really liked Dee as a character. At first, you can tell she's somewhat of a pampered, angsty fifteen year old, pretty average in that way, and who is mad at her parents. They've dropped her off at her grandpa's farm while they're off to an Alaskan cruise. You can tell something has happened between them at the beginning, but you don't know quite what it is. As soon as they leave, Dee gets it into her head that she's going to leave and uses her grandpa's truck to do it. She picks up a hitchhiker, and from that point on, things get really interesting. I loved Dee from that point on. The author didn't waste a bunch of time letting her fifteen year old heroine sit around and angst further, whining about circumstances or denying what's happening. She's smart and acts immediately. She learns quick, and she works to get back to her grandpa. This story ends up with a small mis-matched group of characters working together at her grandpa's farm and learning to survive in a new world where there's no electricity, no good drinking water, and barely any food. I loved and adored every single character in this story, and and they all fit together so perfectly and lent some sort of special element to the story. Aside from the obvious threat and danger of survival, there's also an external threat that comes from a source they never might expect. There was survivalist training, an element of suspense, some heartbreak, and some romance. The author did an amazing job pulling me in and holding my attention until the last exciting, amazing moment. I will definitely be sticking with this series to find out what happens next!